Finally. It’s the most of the wonderful time of year, and we have passed Thanksgiving, so it is now acceptable for stores to be selling Christmas decorations (even though they’ve been doing it since before Halloween). It’s finally time to pull out all the ugly sweaters and fire up the holiday Pandora station. Living in the capital city of North Carolina, I find there are so many things to do to celebrate the holiday season, but start marking your calendars because so many of them happen before the month even begins. We’ve all seen the ice skating rink that’s down on Fayetteville Street. This is it; it will even be there past Christmas (until Jan. 31, 2016). It costs $10, which includes skate rentals. It’s basically the Raleigh version of skating on Rockefeller Plaza. So bundle up and get yourself to the rink. Handel’s “Messiah” encompasses the entire Christmas spirit. This is an opportunity to join in — you can even borrow one of their scores! It doesn’t matter how well you sing; it’s the spirit that you put into it that matters. You may have missed the Raleigh Christmas parade, probably because it happens before Thanksgiving. But here’s another chance to see the Apex Christmas parade, complete with Santa! Having participated myself with my high school marching band, this is one beautiful parade. Taking place at night, it is too beautiful and you will begin to feel the joys of the season. Start working off that holiday weight before the holiday! This way, you won’t feel guilty about enjoying those Christmas cookies. Get into the spirit by wearing a fun costume, or tying bells to your shoes so every step you take sounds like Christmas cheer. This Raleigh traditional concert features many of everyone’s favorite Christmas carols, and the Charlie Brown Christmas Suite. Who doesn’t love Charlie Brown? 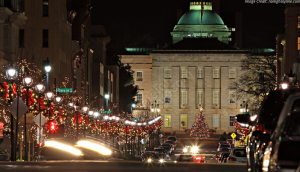 This tour explores downtown Raleigh, including the State Capitol Building, Historic Oakwood, Fayetteville Street, the Governor’s Mansion and the Capitol Christmas tree and Pullen Park. But these are not your normal Raleigh attractions; they’re all decorated for Christmas. This is the perfect tour to put you in the decorating mood. The Raleigh Concert Band will be preforming in honor of the tree lighting ceremony at the capitol building. Once again, downtown Raleigh is basically Rockefeller Plaza. This classic Christmas tale is performed with a modern and comedic spin by N.C.’s own Ira David Wood III. This year, the production is celebrating its 41st anniversary, and has been known as being one of the most successful shows in N.C. history — clearly it’s worth it to check it out. In case you miss both the Raleigh and Apex Christmas parades, you have another opportunity to see Santa (besides at the mall). Make sure to come early and get a good spot to see him! An event open to the public, this amazing high school in downtown Raleigh is raising $100,000 for the charity Learning Together. This formal event, which includes the presentation of the final amount raised, will take place at Marbles Kids Museum. Even if dancing isn’t your thing, consider going to support this amazing organization and group of people. After all, Christmas is a time to give back to those less fortunate, and this is a perfect way to do it. Another Christmas classic brought to life by the Carolina Ballet. Enjoy Tchaikovsky’s beautiful suite and feel yourself fall into the Christmas spirit (and maybe give ideas for Christmas gifts. I’m sure some people do like nutcrackers). Of course, there is so much more to do around Raleigh this month. Most people have their own traditions, which might include hunting for the perfect tree or visiting Santa at the mall. Most importantly, it’s a time for family and another time to be thankful for everything in our lives.